Contrary to what some politicians may believe, overwhelming evidence supports a human catalyst for global climate change and degradation. So, you've heard climate change is a scam? Allow me to clear up some common misconceptions — so common, even a president can make them! 1. Local weather is not an indication of global temperature patterns, averages/rates of warming, cooling, and sea levels. Climate is different than weather. In short, the climate is atmospheric averages over long periods of time while weather is atmospheric occurrences observed during any single instance. Honestly, any junior in high school should know this. Trump's primary concern seems to be monetary capital. His solution? Cut funding for environmental science research and restoration. It truly is ironic that by attempting to save money in short-term, he is suggesting we sacrifice not only trillions^10 USD. in future global infrastructure destruction but the health and well-being of our planets plants, animals, and resources. Keep in mind, the global population is increasing dramatically, and so is use and processing of natural resources. If more effort is not put into sustainable environmental practices and transparency in media — capitalism will take precedence over longevity — and the world will be dead before the next millennium. Unfortunately for Trump, who claims to be right about everything. 2. science does not support his claims that a cold winter indicates a fraudulent climate change. "On the surface it certainly can appear that way (harsh and cold). But just because some of us are suffering through a particularly cold and snowy winter doesn't refute the fact that the globe is warming as we continue to pump carbon dioxide and other greenhouse gases into the atmosphere. According to the National Aeronautics and Space Administration (NASA), the 10 warmest years on record have occurred since 1997. And the National Atmospheric and Oceanographic Administration (NOAA) reports that recent decades have been the warmest since at least around 1000 AD, and that the warming we've seen since the late 19th century is unprecedented over the last 1,000 years." 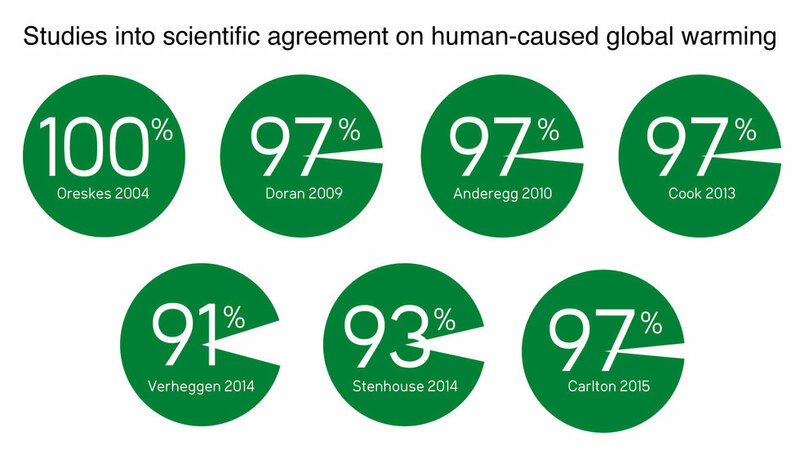 Scientific consensus suggests on average over 95% of professional scientists agree global warming is an immediate and malignant threat. Essentially, the real scam is capitalism and those who deny man-made climate change. It is incredibly dangerous to allow this misinformation to be spread by those with widespread influence. It is not too late to slow the rate of warming. There is already irreparable damage done to many ecosystems, but hope should not be lost. Don't let anyone tell you the cause is hopeless, because if everyone believed that it would be. Although much of the damage done by greenhouse gases in the atmosphere is polluted from companies, companies in which the individual has little or no control over, we do have control over politicians and law-makers who have better access to large-scale methods of downscaling carbon emissions. Let's start at the beginning of time. It is important to keep in mind that The timeline of bipedal homo (upright early humans) extends only 0.01% of the total age of the planet. Often you may hear an argument citing interglacial and glacial periods being a natural part of the Earth's processes. This is actually true. The caveat here is that it takes massive amounts of time (hundreds of thousands) of years to switch between climate maximums and minimums. We know this argument does not support an absence of climate change because the rate of current warming is documented to be 1000s of times faster than ever recorded in 99.9 % of Earths biological history. Significant, indisputable spikes in carbon levels correlated with unprecedented climate patterns line up with the expansion of the mechanical age — only 200 years ago. This is approximately .0001% of the Earths timeline. This leads us to only one conclusion: the rate of climate change is manmade. We know that there has been a severe disruption in the natural processes of the Earth, and without careful attention and policy changes — man will destroy the Earth inimitable a few centuries if we even get that far. So, You've Heard About inter-glacial periods? We're fine then, right? 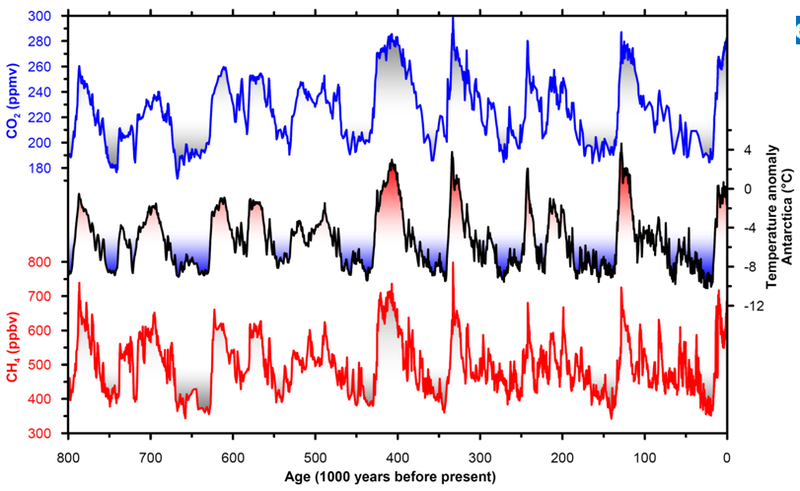 Unfortunately for us, "Each glacial period lasted for 40-100 thousand years, whereas the interglacial periods are shorter, typically 5-40 thousand years." 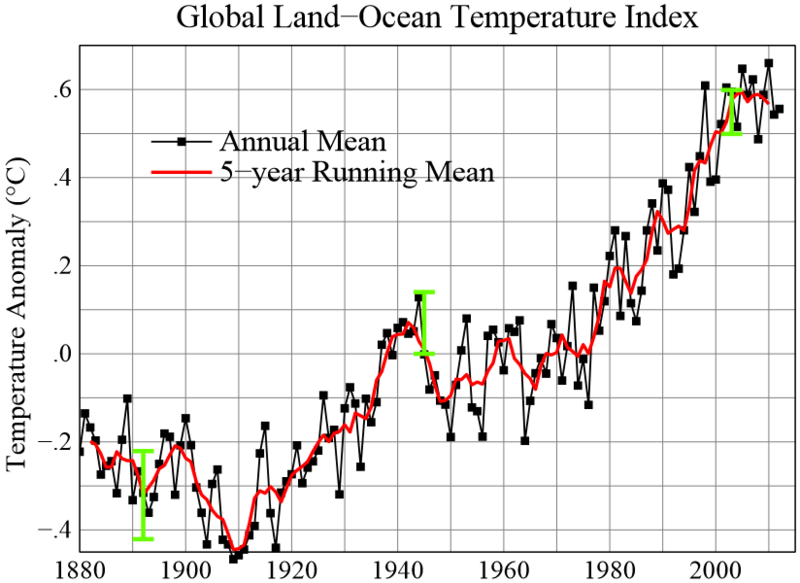 So, it is irrational to suggest the rate of warming (see below under Green House Effect) is naturally occurring. Natural interglacial Periods happen over hundreds of thousands of years--not 200 years. How does global warming happen? 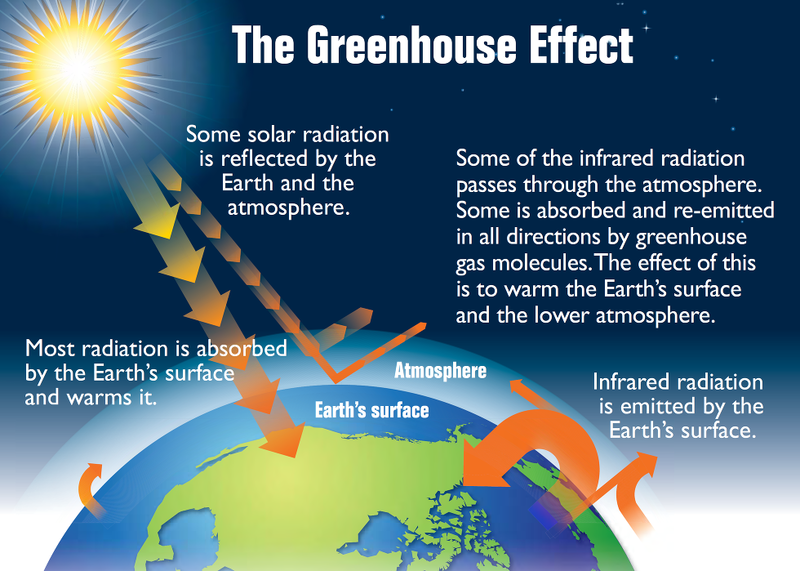 Global warming is attributed to the Greenhouse effect. Human endeavors such as burning coal, oil, and gas release toxins (cO2, Methane, NO2, etc...) into the atmosphere, shattering healthy balances of chemicals that not only humans breath, but the entire Earth breaths. These gases form a semi-barrier high above Earth's surface and traps heat rays inside. The Greenhouse effect is another natural occurrence aggravated by human behavior. Fun fact: Gas, oil, and coal are actually pressurized ancient biotic matter and we only have a finite amount of it! CO2 is the top contributor to the Greenhouse Effect. It is undeniable that human activities have glutted the air with harmful chemical levels. CO2 Rates are climbing exponentially. The only explanation is human pollution. Those who combat science may say: “what is a couple inches of sea level increase to us? I quite enjoy hotter weather." Well, despite being a moral issue as caretakers for this planet being a good enough reason, if it takes personal safety to be in jeopardy for one to care, then there is a reason for concern there, too. Sea level rising will not only flood and destroy coastal towns, but it will also eradicate many crops and marine communities instantly. A few degrees of sea level warming can kill almost all marine life. Marine life is integral for many cultural main sources of food and supplies. Not only will marine ecosystems suffer, but land crop cycles will also be put to the test: and not all industries of marketable food will survive. Basically, if we allow this to continue at this rate within the next hundred years we will see (if we aren't already): food shortages, clean water shortages, infrastructure damage, loss of land, species, and habitat, wildfires, depletion of oil and gas supplies, acidification of oceans, and increasing rates of extreme weather events. Not only will we lose marine ecology, but permanent temperature change also causes unpredictable and chaotic natural disasters. It being cold during certain times of the year is by NO MEANS an indicator of the absence of climate change. Belief in convenient falsehoods will kill us all. Not only will present and future members of the human species suffer because of this, but the planet will also exhaust all of its resources at an exponential rate furthering warming and forever destabilizing all of Earth's biomes, and the life within them. - Reduction of dependence on oil, capitalism, and one-use industries. - Political and social ramifications for polluters and caps on emissions. - A Common Goal: Sustainability of future life on Earth. Are Plastic Straws Really Killing Sea Turtles? It's no secret that plastic isn't great for the environment, but how sensationalized is this topic actually becoming? When I first saw a video of a sea turtle getting a plastic drinking straw removed from its nostril, I was obviously upset like any other viewer would be. I care a lot about the environment and about animal life and it was upsetting to see that a product of human consumption and ignorant waste was destroying precious parts of our world. I wholeheartedly jumped on the bandwagon of "plastic straws kill sea turtles!!!" but only knew about the issue from this video and what I heard from people or saw on social media. The whole topic of plastic waste into the ocean remained in the back of my mind until the recent pledge of Starbucks to stop using plastic straws in stores by 2020 reminded me of the issue. As the topic of plastics and their pollution of the environment (largely the oceans) has become so recently powerful I decided to do some research of my own. If I was going to tell people to stop using plastic straws because they were killing sea turtles, I wanted to be sure that I wasn't just repeating everything I heard from social media. Turns out, plastic straws are hurting sea turtles and other marine life, but a lot of what I thought about plastic waste was exaggerated (at least from what I had heard from others). Sea birds are the most impacted creature by plastic straws, not sea turtles. About 1 million or more seabirds die every year from ingesting plastic straws and choking on them. In research from recent scientific studies, 80-90% of seabirds have some kind of plastic inside of their stomachs. Also, the ecological footprint that plastic straws alone leave on the planet is actually pretty small compared to food waste or fossil fuels. However, all the buzz about sea turtles may come from the fact that globally 86% of sea turtle species are known to be affected by plastic debris. Overwhelming amounts of plastic garbage in the ocean have caused a steady decline of the leatherback sea turtle over the past several years, so much that they have been placed on the endangered species list. Plastics can hinder eating and consumption, breathing abilities, and even reproductive capabilities of all kinds of sea turtles. So while plastic straws may not be killing sea turtles in hordes, they are killing sea birds, and plastic overall have caused huge and deadly effects to many sealife species. We have known that plastic is bad for the environment and the oceans for quite a while, given the fact that the Great Garbage Patch was discovered almost 20 years ago, so it's more than time to start caring about the problem. If we can eliminate single-use plastic straws that aren't biodegradable, we can stop using other single-use plastics and make a better effort to reduce our harmful impacts on the oceans. Individually, we can move towards small changes, which can move our society to a more sustainable and healthy place. If you are more interested in this topic, I would suggest reading about how you can make a change or looking at this article and checking out this scientific journal. Here are a few easy tips that will help you protect the beautiful planet we live on. Living sustainably has been a major focus of my life recently after finding out that it's not that hard for me to do my part. We live on a beautiful planet that contains the resources that help life as we know it to operate. We are dealing with problems that are caused by humans such as smog, trash in the oceans, and polluted waterways. While we can't fix pollution by ourselves, we can do our small part to help keep our planet clean and safe. So here are some easy, tangible tips that all of us can do to live more sustainably. In elementary school, we all learned about reducing, reusing, and recycling. 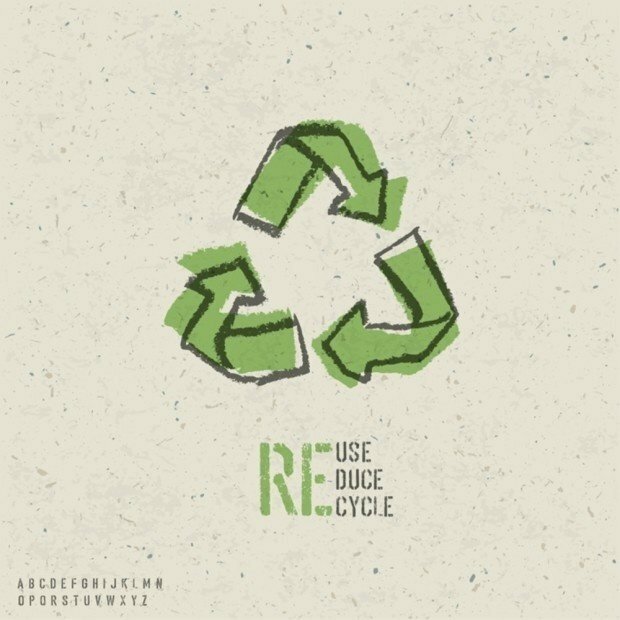 Recycling is one of the easiest things we can do because most colleges and communities already recycle and it just takes a conscious effort to differentiate your waste between trash and recycling. If your community doesn't have an easy recycling process, you can still put in the extra effort of taking it to the local recycling plant or request curb side pickup. The reason we need to recycle is that trash in landfills can release both harmful chemicals and greenhouse gases into the environment so we are cutting down the amount of trash that ends up in landfills and allowing our goods to live longer lives. Motor vehicles account for most of the United States' carbon monoxide pollution according to the EPA. 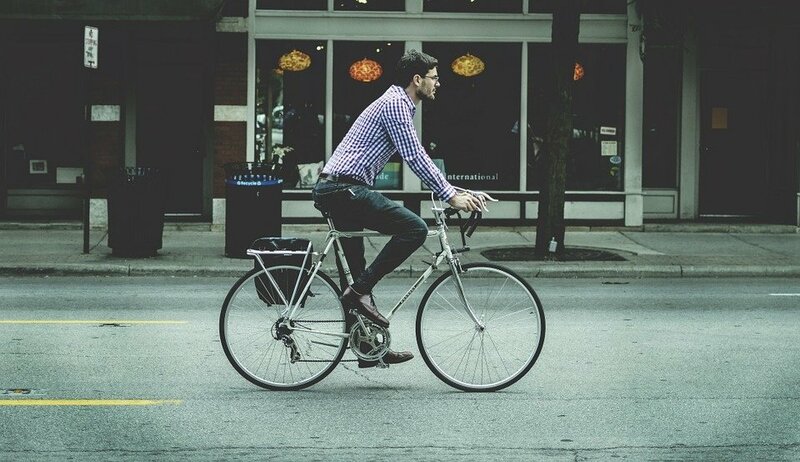 Some easy solutions to this problem would be to carpool more, drive a car or scooter that get's really good gas mileage, walk or bike to school or work, or use public transportation. This is an incredibly easy change that you can make in your life that will help out the planet. Take quicker showers, turn the water off when you are washing your hands or brushing your teeth, and try not to take baths often. 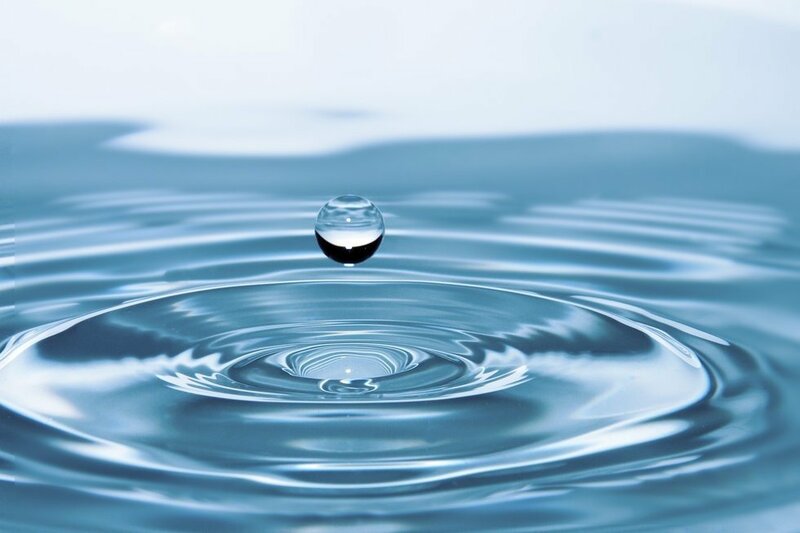 Not only will this limit your impact on the earth's already small amount of fresh water, but it will save you some money on your water and energy bills every month. 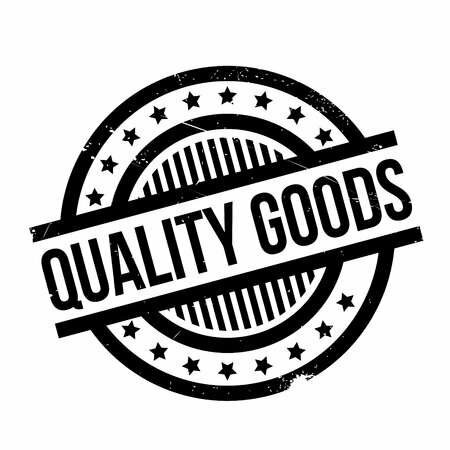 Whether it be clothes, household items, or equipment for whatever your hobbies are, spending extra money on something that will last you a long time rather than wasting money on cheap stuff that you will end up throwing away after a few months will save you money in the long run and will help you reduce your trash output. Extending the lifetime of your items has the same benefits as the prior point. You'll be saving money and you get the added benefit of an emotional connection to an item because you've fixed it and it's been in your life a long time. 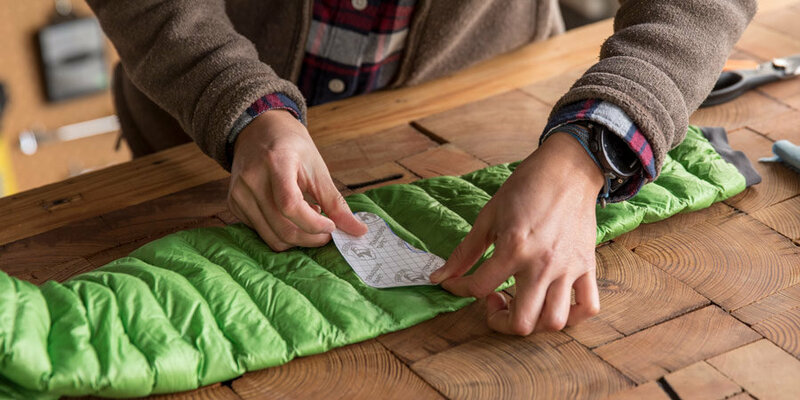 Whether you're patching up a hole in your coat or repairing the soles of your shoes, you're keeping that item alive and out of a landfill. This one is the easiest out of all of them. Single-use plastics are one of the worst environmental impacts humans are having on our oceans. In 2012 there was a reported 165 million tons of plastic in our oceans. While a lot of is does degrade after about a year, the degrading plastic releases harmful chemicals into the water and more plastic is going into the ocean every year. Marine animals are also being harmed by plastic in the oceans if they try to eat it or are caught in it. 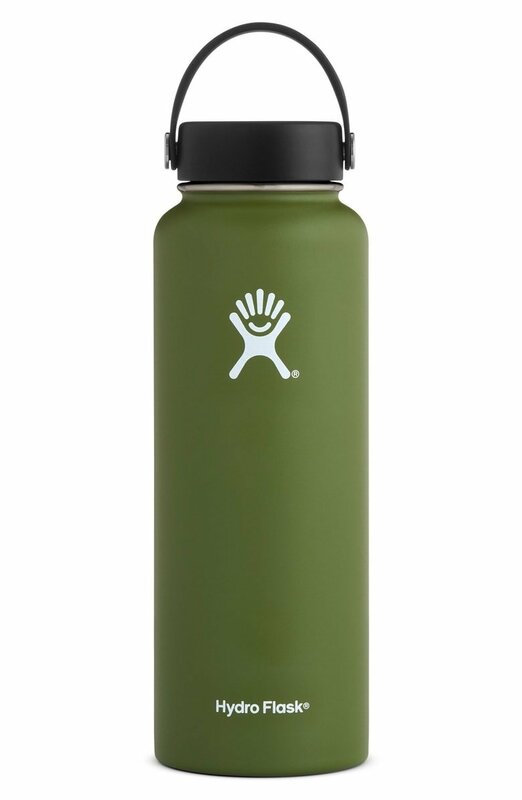 Reusable water bottles help cut down on plastic pollution. If you don't like the taste of your tap water, I'd recommend getting a water filter! Plus, you can cover your water bottle in stickers which makes it personal to you!